Audioengine releases D3 USB DAC and A2+ computer speakers | What Hi-Fi? Audioengine has announced a new USB DAC and an upgrade to the A2 desktop speakers. Both claim to greatly improve the audio output from a Mac or PC. Audioengine has announced details of two new products; the D3 USB DAC and the A2+ desktop speakers. 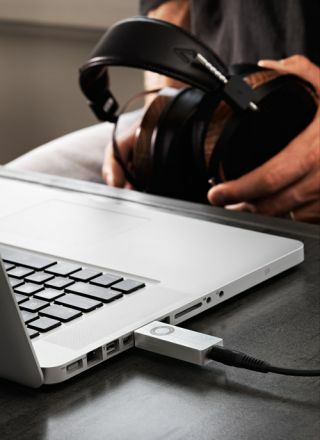 The D3 USB DAC supports and upsamples to 24-bit/96kHz high-resolution audio straight out of the box, with no drivers or installation software needed. The D3 can drive low and high impedance headphones, and comes with a 3.5-6.3mm headphone jack. As well as featuring asynchronous data transfer with dual master clocks to accept audio from any computer, the volume of the computer OS can also be controlled. Audioengine director, Brady Baruqenquast, said: "If you're looking for an ultra-portable DAC that drives even the lowest-impedance headphones, the D3 won't disappoint." The Audioengine D3 USB DAC is available now for £165. The Audioengine A2+ desktop speakers meanwhile, are an upgrade to the original Audioengine A2 speakers. Updates include the addition of a USB DAC and a new power supply. The left speaker is powered, and the right is passive. Custom Kevlar woofers and tweeters deliver 15W RMS, with 30W peak per channel. A Dual Class AB Monolithic amplifier is built in too. The A2+ speakers feature mini-jack, RCA and USB inputs, and mini-jack and USB cables are supplied in the box. The optional W3 wireless adaptor can be added to the speakers, to allow for AirPlay streaming. The Audioengine A2+ desktop speakers are available now in satin-black, or high-gloss white finishes for £215. The W3 wireless adaptor retails for £125.